The Ross PowerMix is ideally suited for the mixing and dispersion of minor ingredients into a major carrier. The patented PowerMix is unique and includes two separate agitation systems within one mixer. A planetary blade revolves in combination with a separate high speed dispersion blade. Both revolve on their own axis as well as on a common axis and the speed of each can be varied independent of the other. This combination allows a user to fine tune the mixer to meet his specific process needs and the shear rates that are required to optimize his process. 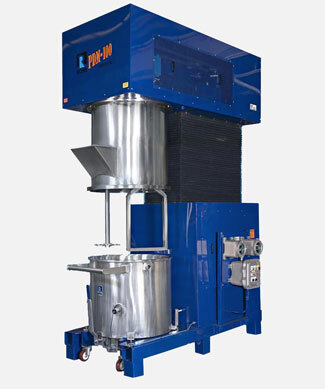 The PowerMix is used for high viscosity vacuum mixing and dispersion as well as the dispersion of minor liquid or powder ingredients into powder mixes. The PowerMix is available in many sizes from a ½ gallon laboratory unit, through a 750-gallon production model. Many optional features are supplied and include a range of materials of construction, vacuum and pressure designs, jackets to heat or cool, wall scrapers, sanitary construction, etc. Test and Trial Rental machines are available for evaluation prior to purchase.